Many musicians use more than one board. Perhaps an acoustic set-up and an electric one. 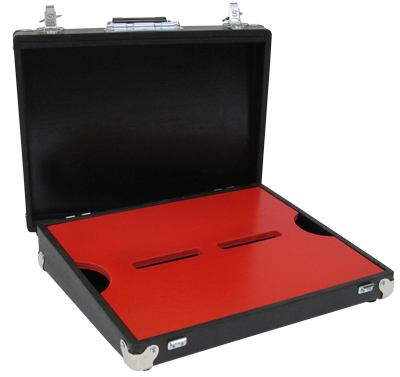 With the ProFX™ board, you don't need to buy a separate case, just puchase a separate red board insert and switch them out when needed. Our stand color is Filmore Black but we have GoGo Red and Marquee Silver available at a small extra charge. Exterior Dimensions W18" x D15" x H5" W24" x D15" x H5" W28" x D15" x H5" W33" x D15" x H5"
Interior Dimensions W17" x D15" x H5" W23" x D15" x H5" W27" x D15" x H5" W32" x D15" x H5"